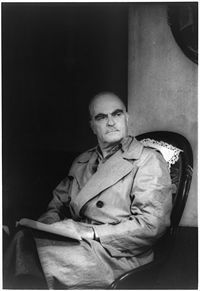 Thornton Wilder as Mr. Antrobus in The Skin of Our Teeth, photographed by Carl Van Vechten, August 18, 1948. Thornton Wilder (April 17, 1897 – December 7, 1975) was an American playwright and novelist. Wilder's inspired novels and plays reveal his views of the universal truths in human nature and he often used the same characters in a range of geological and historical periods showing that the human experience is similar regardless of the time or place. Wilder incorporated the strategy of make-believe by having the actors address the audience directly and by not using props and scenery. He won the three Pulitzer Prizes (both fiction and drama), numerous Tony Awards, and many other literary awards for his work. His works are read, performed, studied, and appreciated by audiences worldwide. An thought provoking aspect of his literary legacy is that on the one hand he found life wonderful but on the other admitted that many people experience tragedy and terror. Yet, he believed in the possibility of making a better world, that the good in people can defeat the bad. Thornton Niven Wilder was born in Madison, Wisconsin, and was the son of Amos Parker Wilder, a U.S. diplomat, and the former Isabella Niven. All of the Wilder children spent part of their childhood in China due to their father's work. Isabella Niven Wilder, his mother and a cultured, educated woman, wrote vivid poetry. She instilled a love of literature, drama and languages in her children. Wilder's older brother, Amos Niven Wilder, was Hollis Professor of Divinity at the Harvard Divinity School, a noted poet, and a nationally-ranked tennis player who competed at the Wimbledon tennis championships in 1922. His youngest sister, Isabel Wilder, was an accomplished writer. Both of his other sisters, Charlotte Wilder (a noted poet) and Janet Wilder Dakin (a zoologist), attended Mount Holyoke College and were excellent students. Thornton Wilder also had a twin brother who died at birth. Wilder began writing plays while at The Thacher School in Ojai, California, where he did not fit in and was teased by classmates as overly intellectual. According to a classmate, “We left him alone, just left him alone. And he would retire at the library, his hideaway, learning to distance himself from humiliation and indifference.” His family lived for a time in Berkeley, California where his sister Janet was born in 1910. He attended the English China Inland Mission Chefoo School at Yantai but returned with his mother and siblings to California in 1912 because of the unstable political conditions in China at the time. Thornton also attended Emerson Elementary School in Berkeley, and graduated from Berkeley High School in 1915. Wilder also studied in law for two years before dropping out of college in Berkeley, California. After serving in the United States Coast Guard during World War I, he attended Oberlin College before earning his B.A. at Yale University in 1920, where he refined his writing skills as a member of the Alpha Delta Phi Fraternity, a literary society. He earned his M.A. in French from Princeton University in 1926. In 1926 Wilder's first novel The Cabala was published. In 1927, The Bridge of San Luis Rey brought him commercial success and his first Pulitzer Prize in 1928. From 1930 to 1937 he taught at the University of Chicago. In 1938 and 1943, he won the Pulitzer Prize for drama for his plays Our Town and The Skin of Our Teeth. World War II saw him rise to the rank of lieutenant colonel in the United States Army Air Force and he received several awards. He went on to be a visiting professor at the University of Hawaii and to teach poetry at Harvard. Though he considered himself a teacher first and a writer second, he continued to write all his life, receiving the Peace Prize of the German Book Trade in 1957 and the Presidential Medal of Freedom in 1963. In 1967, he won the National Book Award for his novel The Eighth Day. He died in his sleep, December 7, 1975 in Hamden, Connecticut, aged 78, where he had been living with his sister, Isabel, for many years. Wilder had a wide circle of friends and enjoyed mingling with other famous people, including Ernest Hemingway, Willa Cather, and Gertrude Stein. Wilder translated and wrote the libretti to two operas. Also Alfred Hitchcock, whom he admired, asked him to write the screenplay to his thriller, Shadow of a Doubt. The Bridge of San Luis Rey (1927) tells the story of several unrelated people who happen to be on a bridge in Peru when it collapses, killing them. Philosophically, the book explores the problem of evil, or the question, of why unfortunate events occur to people who seem "innocent" or "undeserving." It was an examination of justice and altruism. The Bridge of San Luis Rey won the Pulitzer Prize in 1928, and in 1998 it was selected by the editorial board of the American Modern Library as one of the 100 best novels of the twentieth century. The book was quoted by British Prime Minister Tony Blair during the memorial service for victims of the September 11 attacks in 2001. Since then its popularity has grown enormously. The book is the progenitor of the modern disaster epic in literature and film-making, where a single disaster intertwines the victims, whose lives are then explored by means of flashbacks to events before the disaster. Wilder was the author of Our Town, a popular play (and later film) set in fictional Grover's Corners, New Hampshire. It was inspired by his friend Gertrude Stein's novel The Making of Americans, and many elements of Stein's deconstructive style can be found throughout the work. Our Town employs a choric narrator called the "Stage Manager" and a minimalist set to underscore the universality of human experience. (Wilder himself played the Stage Manager on Broadway for two weeks and later in summer stock productions.) Following the daily lives of the Gibbs and Webb families as well as the other inhabitants of Grover’s Corners, Wilder illustrates the importance of the universality of the simple, yet meaningful lives of all people in the world in order to demonstrate the value of appreciating life. The play won the 1938 Pulitzer Prize. Wilder suffered from severe writer's block while writing the final act. That same year Max Reinhardt directed a Broadway production of The Merchant of Yonkers, which Wilder had adapted from Austrian playwright Johann Nestroy's Einen Jux will er sich machen (1842). It was a failure, closing after just 39 performances. His play The Skin of Our Teeth opened in New York on November 18, 1942 with Fredric March and Tallulah Bankhead in the lead roles. Again, the themes are familiar—the timeless human condition; history as progressive, cyclical, or entropic; literature, philosophy, and religion as the touchstones of civilization. Three acts dramatize the travails of the Antrobus family, allegorizing the alternate history of mankind. In 1955, Tyrone Guthrie encouraged Wilder to rework The Merchant of Yonkers into The Matchmaker. This time the play enjoyed a healthy Broadway run of 486 performances with Ruth Gordon in the title role, winning a Tony Award for Guthrie, its director. It later became the basis for the hit 1964 musical Hello, Dolly!, with a book by Michael Stewart and score by Jerry Herman. His last novel, Theophilus North, was published in 1973. Wilder's legacy includes his enduring body of work, and his affirmation of the reality of universal truths in human nature. He believed that all people have an inbuilt urge to improve the quality of life by creating harmony, whether in families, community or on a wider stage. He regarded the world as his home and was optimistic about the possibility of making the world a better place, which to some extent was for him a global extension of the American Dream. Life for him was both a wonder, and full of potential terror. He spoke of the spark of immortality within all people. Usually described as a humanist, his humanism saw eternal value in human life and he retained faith in God throughout his life. He drew on classical literature, myth and fable. ↑ Biography, Thornton Wilder Society, 2003. Retrieved December 15, 2007. ↑ Thornton Wilder, Kuusankosken kaupunginkirjasto, 2000. Retrieved December 15, 2007. ↑ Masterpiece Theater, American Collection, Our Town Public Broadcasting Service, 2008. Retrieved December 15, 2007. McClatchy, J. D. (ed.). Thornton Wilder, Collected Plays and Writings on Theater. Library of America, 2007. ISBN 9781598530032. This page was last modified on 6 August 2013, at 16:56.